With the ancient grain festival of Lammas (Lughnasadh) just past us on August 1, traditionalists are thinking of homemade breads. And yet, traditional breads require long preparation time and extended use of a hot oven—not really the thing for August. Enter the pizza, America’s near-favorite bread (just behind hamburger buns, go figure). 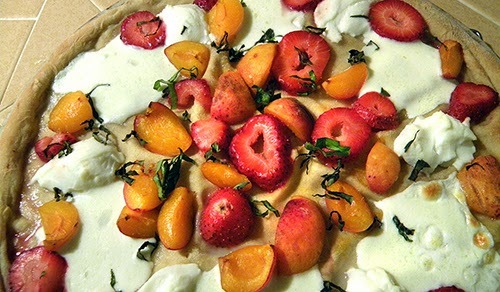 And what more seasonal way to celebrate grains than pairing the pizza crust with plentiful summer fruits and young cheeses? 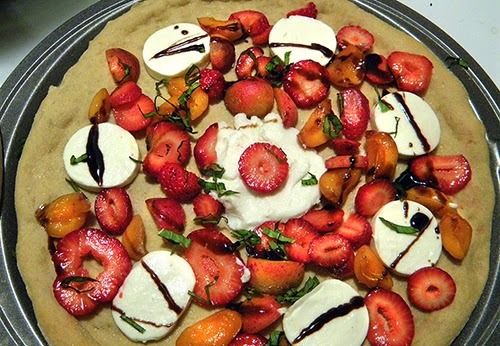 This recipe will make two 12-inch pizzas or 6-8 small “pizzettes.” Throw an informal pizzette party by inviting family or friends to roll their own dough, then arrange the apricots, strawberries, cheeses, and garnishes on their food creation. Pop them into the oven for about 10 minutes and enjoy for a mid-afternoon treat, or for a fun lunch or dinner. 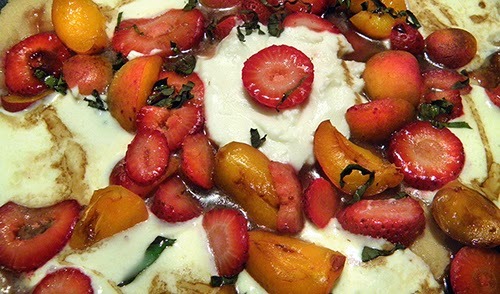 This recipe debuted at the LiveEarth Farm Solstice party. LEF recipe maven and local nutritionist Rebecca Mastoris helped kids build their own pizzas, then fired them up in the outdoor cob oven. The kids loved the hands-on approach and feasting on their food creations. For the cheese, Rebecca used ricotta and fresh chevre, the latter provided by LEF’s resident goats. Instead of chevre, I used a fresh (not aged) mozzarella to keep the taste light. Use whatever cheese you like, but bear in mind that stronger cheeses can overpower the delicate sweet fruits. This pizza has a light and simple crust with no cornmeal or semolina flavoring or texture, which suits the lightness of the fruit flavors. Note that the crust must rise for one hour before punching down and rolling out. However, unlike some crusts, it does not need to rise again after rolling. Also, the dough can be prepared up to 24 hours in advance. Once it has risen and you’ve punched it down, form it into a ball, wrap it tightly in plastic wrap, and store in the refrigerator. Leave us a comment if you’ve experimented with these or other fruits on pizza. Remove stones from apricots and slice into quarters or halves, depending upon their size. Wash and hull strawberries. Cut into approximately 3/8 inch thick slices. Set aside. Make pizza dough: sprinkle yeast onto warm water in small bowl and stir to dissolve. Stir in a pinch of sugar. Wait 5-10 minutes for the yeast to become active. You will see some foamy bubbles when it’s ready. Meanwhile whisk together unbleached and wholewheat flours with salt in medium bowl. When yeast is activated, add yeast to flour, along with the honey and olive oil. Stir together (using hands is easiest) until dough becomes a sticky ball. Depending upon your flour, you might need to add up to ¼ cup more unbleached flour to make the dough come together. Conversely, you might want to add up to a couple tablespoons of water if the dough seems very thick and dry. Transfer the dough to a hard, floured surface. Knead until dough is smooth and starts to become elastic, adding more flour as needed on hands and board to prevent sticking. Form the dough into a smooth ball with no seams. This will take about 5 - 7 minutes. Oil a large bowl generously with olive oil. Plop dough ball into the bowl and turn over to coat the dough with oil. Cover bowl with moist towel and let rise in a warm spot free of drafts (I use a heating pad on low beneath the bowl). Let it double in bulk, about an hour or a bit more. Punch down dough and divide into 2, 6, or 8 pieces. Roll out on lightly floured board. Transfer dough rounds to pizza pans or baking sheets. It’s easiest to do this with a metalpizza peel. You can also store the dough, well wrapped, in the refrigerator for up to 24 hours before rolling it out. Put the pizza crusts into the preheated oven and prebake for 2 – 3 minutes, until crust surface is dry. This prevents sogginess. 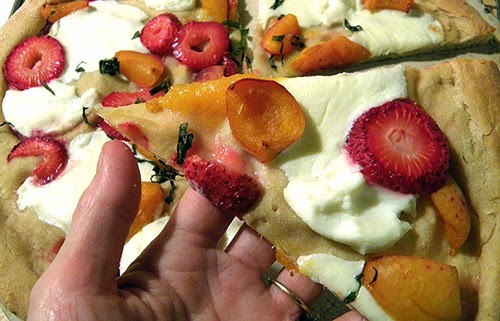 Distribute sliced mozzarella, apricots, and strawberries as desired on the pizzas. Add a few dollops of ricotta cheese. Sprinkle with chopped basil and fresh ground black pepper, and drizzle with balsamic vinegar as desired. 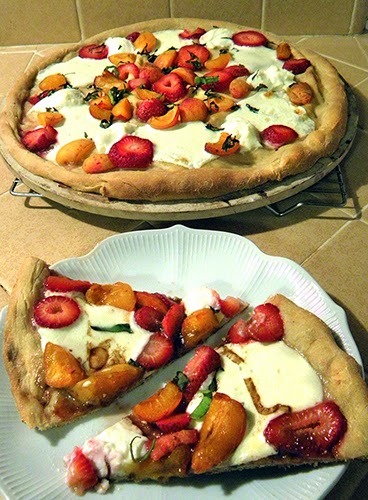 Slide pizzas into oven and bake until crust edges are golden brown, cheese is melted and fruit begins to soften. This will be about 10 – 15 minutes for two large pizzas, and about 5 – 10 minutes for pizzettes. Check the oven frequently to prevent burning. Remove pizzas from oven. Cool slightly, slice, and enjoy. Yes, it's nearly that season again in Santa Cruz (a few more weeks for the apricots). Thanks for the reminder, I had forgotten this yummy recipe.